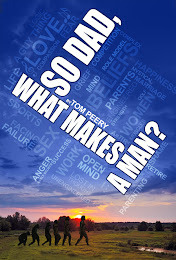 What does make a man? Those informed and inspired by the late psychiatrist M. Scott Peck’s ground-breaking, 1980s-bestseller The Road Less Traveled will welcome the themes in So Dad, What Makes a Man, a book by Tom Peery that covers wide-ranging ground about personal growth into manhood, in refreshing ways, given the profound need for diverse voices of reason to promote positive messages. Peery, a former engineer now retired and living in Houston with his wife, no longer neatly fits a category of what some may define as typical white, Boomer-generation corporate man. Nowhere is this more apparent than when he acknowledges how the first half of his life was spent participating — through tacit support or silence — in much of what he now laments about America and the direction we’re heading. He is deeply concerned about the widening gap between rich and poor, ineffective political systems and quasi-leadership by men in public office whose personal gain matters more than problem-solving to promote progress for this country. Peery is among the voices of reason. Although So Dad, What Makes a Man seems limited in scope due in part to its title and autobiographical nature, the book actually covers broad subject matters relevant to navigating adulthood in general. Peery’s well-paced stories show that asking questions helps us take personal responsibility in seeking solutions that allow us to grow and mature. This is applicable as we navigate and overcome various challenges in life, whether self-imposed or due to upbringing and cultural influences.